I love these curtains! They are a rich heavy fabric and look beautiful down or tied back. They do block out the light completely. I ended up hanging without clips and it looks elegant. 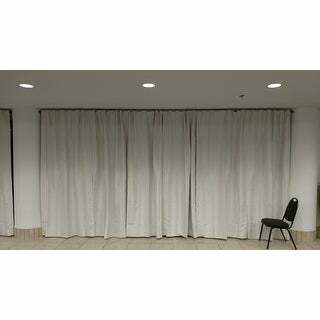 Receive the privacy you need with this black silk curtain. 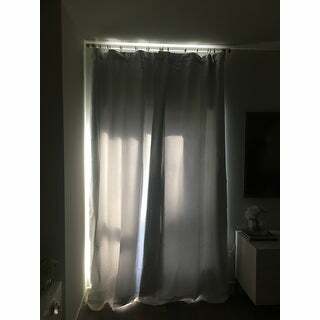 This curtain is available in a number of different sizes and colors, giving you the ability to block out unnecessary lighting while adding a beautiful and decorative look to any setting. THE CURTAIN PANELS WERE A GREAT OFF WHITE COLOR THAT IS TRUE...MEANING NOT TO YELLOW OR TAN THAT AVERAGE OF WHITES APPEAR. UNFORTUNATELY THE SIZING IS WAY OFF THE PANELS ARE 43" INCHES VS. THE 50"INCHES STATED WITHIN THE DESCRIPTION. WHICH MAKES A HUGE DIFFERENCE IN WINDOW MEASUREMENTS. THE BLACK OUT BACKING IS TRUE & NICE NO SUNLIGHT GLARING THROUGH. 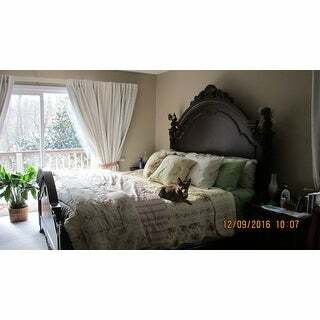 Long, lux looking curtains at a great price. Very heavy and stiff because of the blackout lining. Effective black out function. 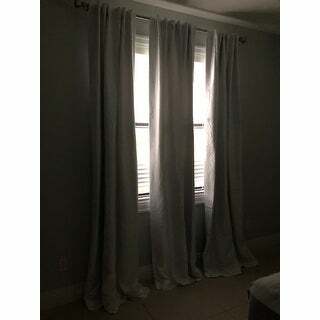 But I took off one star because the blackout lining is not a consistent length -- there is a few inches difference between curtains (I ordered 6 panels) which can be seen because the bottom of the curtains let though between 0 and 3 inches of light. This would only be noticeable if hung on front of a door or floor to ceiling window, as mine are. They are great looking. Just be aware that they have a gray undertone because of the blackout fabric - so even though the white fabric is a pure white, it needs to be used in a space with gray accents. 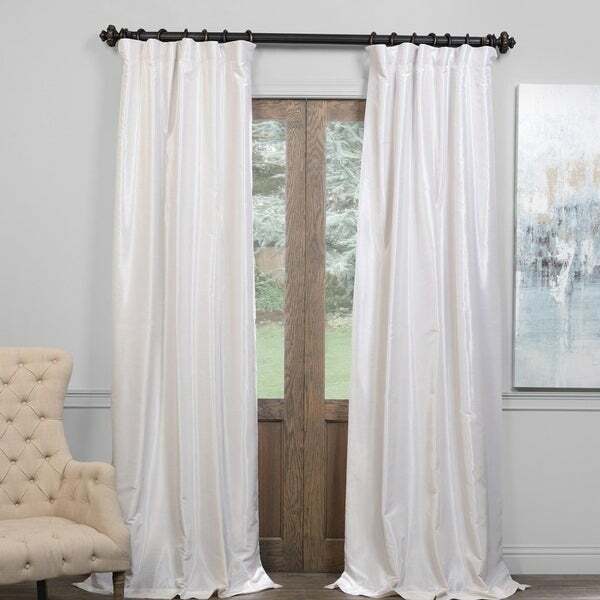 Fyi, these silk curtains match the off-white color of the extra wide option by the same brand - even though the description is slightly different. Good info: the bottom 2 1/2" of the fabric is *not* blackout. Take this into consideration when purchasing the length and hanging. 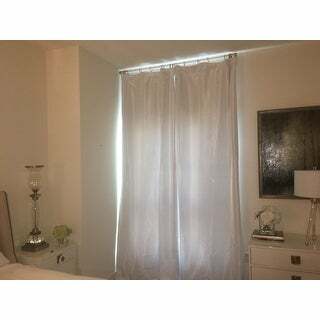 These curtains are meant to drape about 3" on the ground so light won't seep through the silk at the bottom. I ALWAYS read reviews before a purchase. Thanks guys you didn’t steer me wrong. I brought the 50 x 84 and its truely true to its size. I went outside to see if you could see inside the house and NOPE! Material✔️ Length✔️ Quality ✔️ Blackout ✔️ I will have to steam out the wrinkles but this was a GREAT BUY. Very happy customer. Elegance at a low price. The blackout vintage textured faux Dupioni silk curtains are beautiful. The blackout is just enough for a bedroom that I still want some light coming through. The Dupioni silk curtains appear very tailored and hang beautifully to the floor. Best investment I've made during this Christmas season. They are black out for real !!! Very good quality. They look expensive. I uploaded pictures so you can see how they look with different lights. To me see pictures helps a lot. I highly recommend this. This ones are color Ice and 108”. Our bedroom has a wide sliding glass door, as well as a pair of large windows on another wall, so finding curtains presented a big problem. 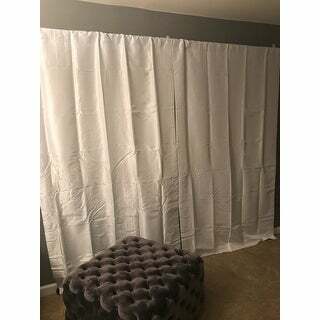 Using these elegant blackout (and thermal) curtain panels, I was able to cover all window areas at a decent price, with lovely panels that look far more rich and expensive than they were on Overstock. Most people assume they were custom-made, and we've received many, many compliments on the look. 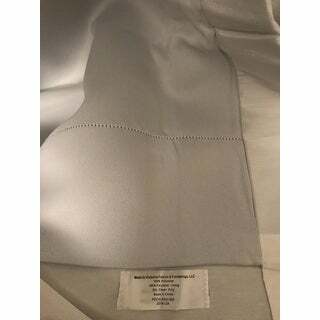 Just got the off white curtains. I should have ordered the 84" instead of the 96", they drape way too long, But still beautiful. I have a pub table against them so you don't really notice as much. I'm happy with these. Curtains are heavy and definitely block out light which is what i wanted. The next window i think i'm going to get the color in plum to add some extra color to the room. The silk sheen is very much an eye catcher, and actually gives you a subtle silky shine, which i like. Too shiny can go overboard. These Blackout vintage Textured Faux Dupioni Silk Curtains are absolutely beautiful. They did have to be steamed to get the wrinkles out but the time was worth it. The perfect color, peacock. It's nice to have the blackout feature in my room. These are the best curtains and I will be back for more. Very classy and looks expensive. We purchased these for our meeting room to gain more privacy when having meetings and other social events. They were easy to install...well I had help because they are heavy...and give an overall feeling if warmth. 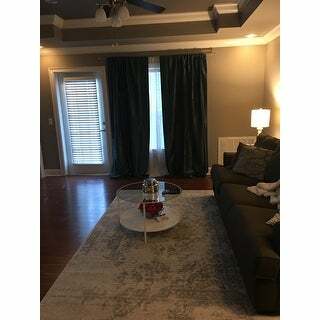 I love the way these curtains look in my living room. They are so elegant looking and the peacock color is gorgeous. I had these in Ivory that I purchased about 4 yrs ago. When the time came to buy another ones in Navy I knew right always where I need to go and what I needed to buy . No searching, no googling, no reading reviews... it was simple; add to cart; complete order! Fabulous! Great color, great quality! Arrive on time as promised. Color is very nice and it is really thick curtains I’ve never own . Curtain weight down on the bottoms so it won’t moves bottoms parts of curtain also has curtain rod packets . I HAD to write a review because before I found these I bought the *** silk duponi curtains for *** each....and let me tell you, these are nicer! Thicker, weights at the bottom all around better. The off white color is lovely, it does have a grayish tint (so do the pbarn ones). These curtains look very expensive. Beautiful in my dining room. Good quality and looks as represented. Shimmer has grey tendency, but that is what I wanted, would buy more in different colors. Must be steamed. These were exactly what I was expecting. Good color match & does a good job at blocking out the light in our bedroom. I am happy with this purchase. 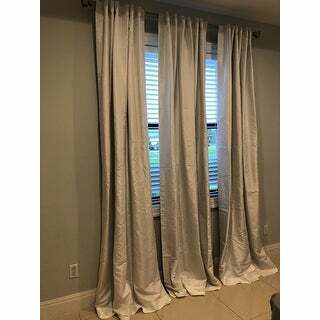 These curtains are the perfect shade of off white that I was searching for and the fabric has that sheen to it that makes it beautiful. 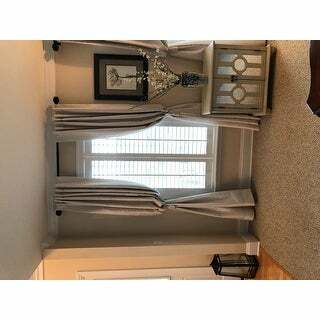 The curtains are very expensive looking and great quality. Would definitely recommend. Planning to purchase more. 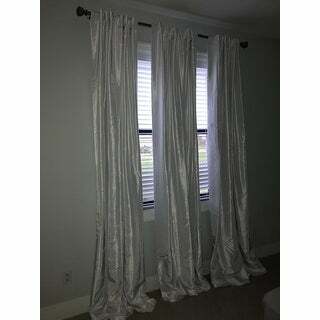 The curtains are beautiful and good quality! "is the purchase for a single panel or for a set of two?" This is only one panel. "What color is the lining? Does it match the front?" The liner is off white. "Is Loyalty Blue available now please?" Unfortunately, Loyalty Blue is a color that has been discontinued and will not be returning to our lineup. We apologize for any inconvenience this may cause. "Which is the "Captain's Blue"? " It's a number 4 on the pictures. "Will you be getting more off white 96” panels in stock? Ordered one for color check but I need 6 total. " We expect these panels to return to our inventory the second week of February. "are these 'plastic' or fabric lined?" This curtain has a fabric blackout liner. "What is the color name of the curtain posted in picture 8?" At this time Loyalty Blue is no longer available.